I like the spaces in my home to do two things for me: 1) look pretty and 2) function well. After two years of living in my condo, my entryway was neither of these things. 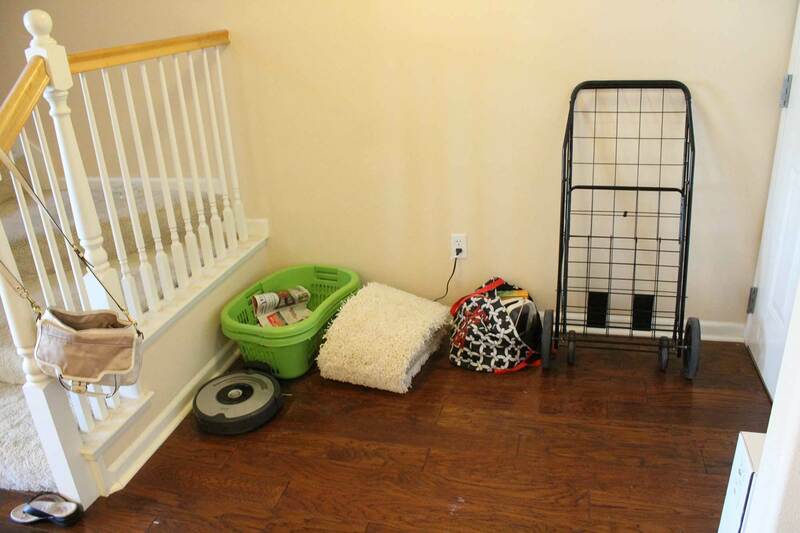 When you walked in the door, you were immediately greeted with a bright green laundry basket doubling as a recycle bin sitting on the floor next to a Roomba. Not pretty. As you walked a bit further into the room, you'd find a scattering of shoes where I'd lazily kick them off as I went upstairs. Not functional. 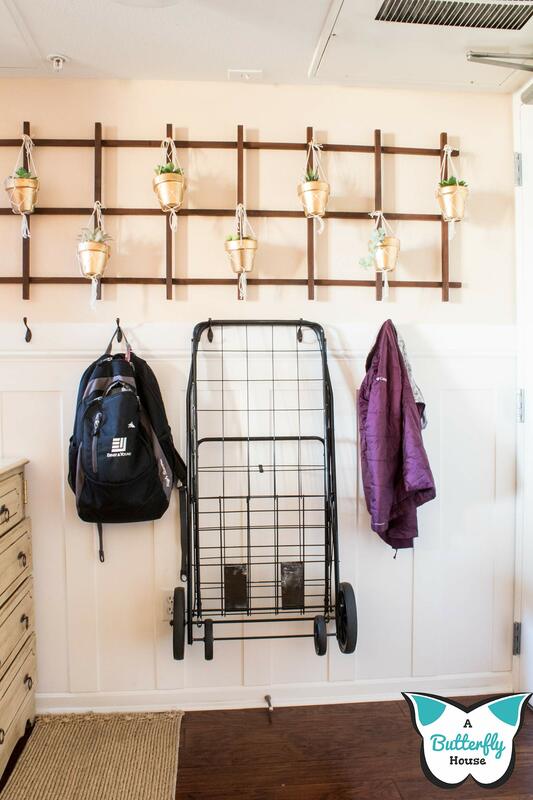 And lets not talk about the metal cart against the wall, or the bag of classroom accessories that had been sitting on the floor for over a year. I'm not joking. The entryway. Note the general unattractiveness, and random shoe hanging out in the lower left corner. And yes, that is a George Foreman grill in the classroom accessories bag. I was that teacher who had a "panini maker" in her classroom. Thus began The Entryway Intervention Project. 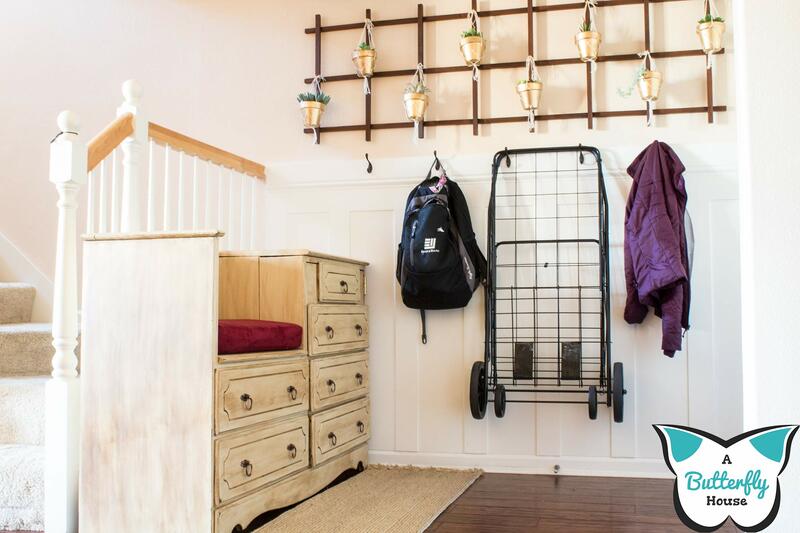 The goal: Create an attractive entryway space that requires absolutely no thought to keep clean. Because, if the classroom accessory bag is any indication, I'm not terribly inclined to tidy my entryway space on any sort of regular basis. To plan this out, I first considered what I needed to store in the space. Given my before picture, I knew I needed a place for shoes, a place to set my things at the end of the day, some sort of recycling center, and a storage area for my cart. I also wanted a place for the Roomba, but (spoiler alert!) that didn't work out. 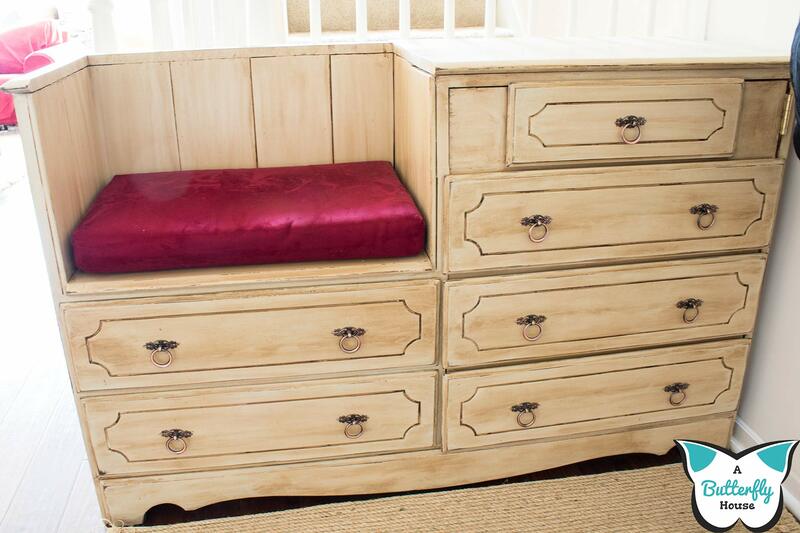 Since the staircase was similar to the length of many dressers, I ended up converting a dresser I found at Savers to a recycle bin/bench/storage center. I stored the shoes in the bottom drawer of the bench section, and made the right side the "recycling center." 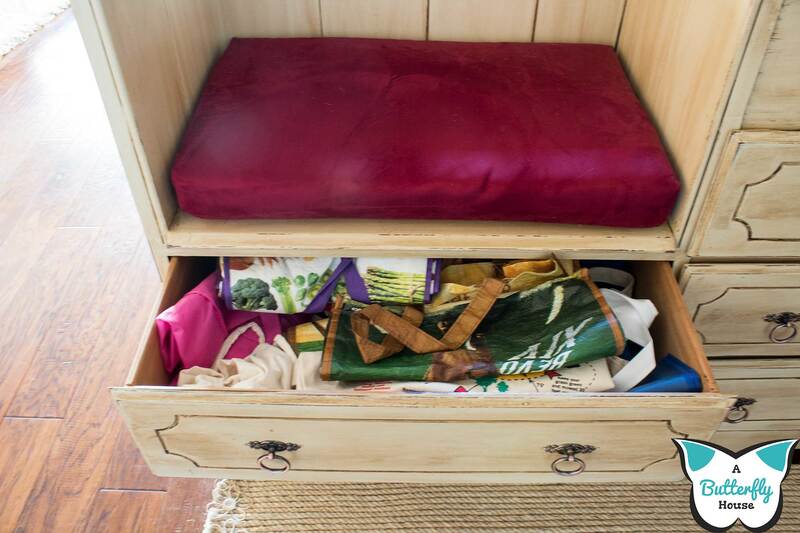 I stored my reusable bag collection in the extra drawer with the hope that having it closer to the door would improve my ability to remember to grab some bags when I was going grocery shopping. 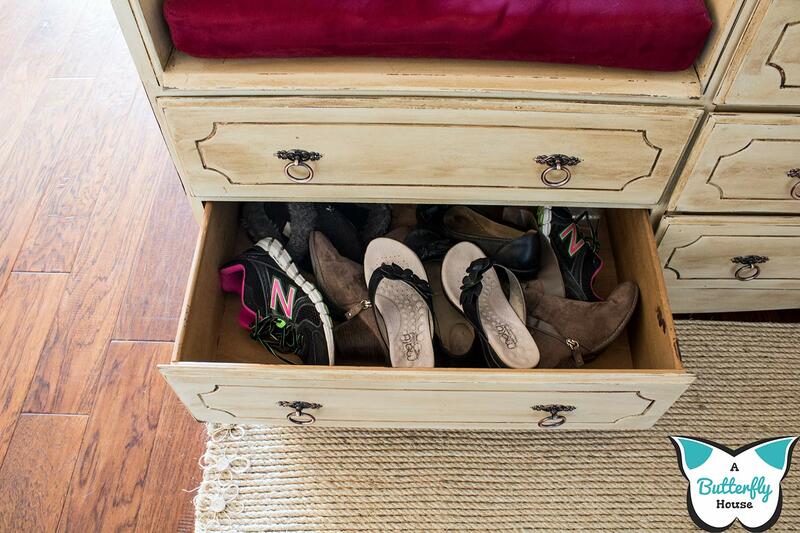 As you might have guessed, I don't store all my shoes in the shoe drawer- just the ones that I wear regularly. About a decade ago, I read one of those supposedly inspirational, "change your life" organizational books. 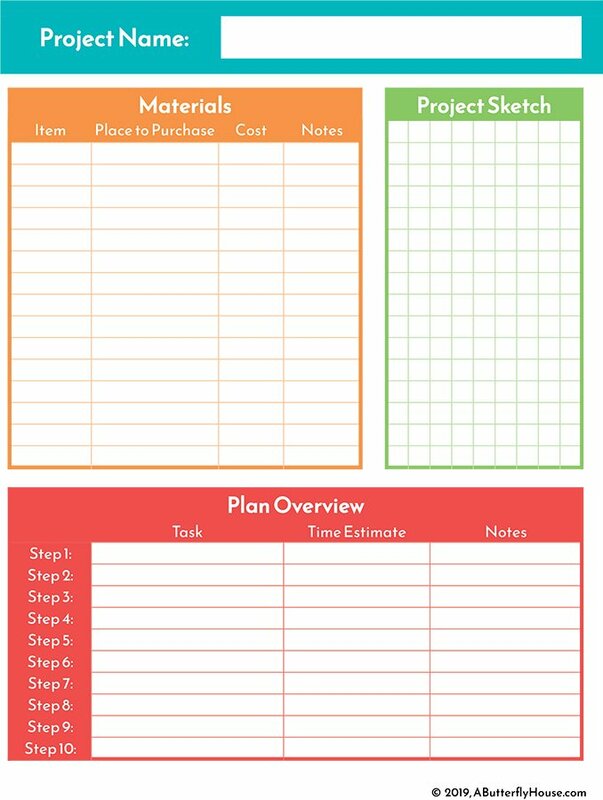 I remember exactly one thing from it: that if you want to be organized, your organizational system has to be easy to use. The more "steps" there are to using the system, the less likely a person is to use it. 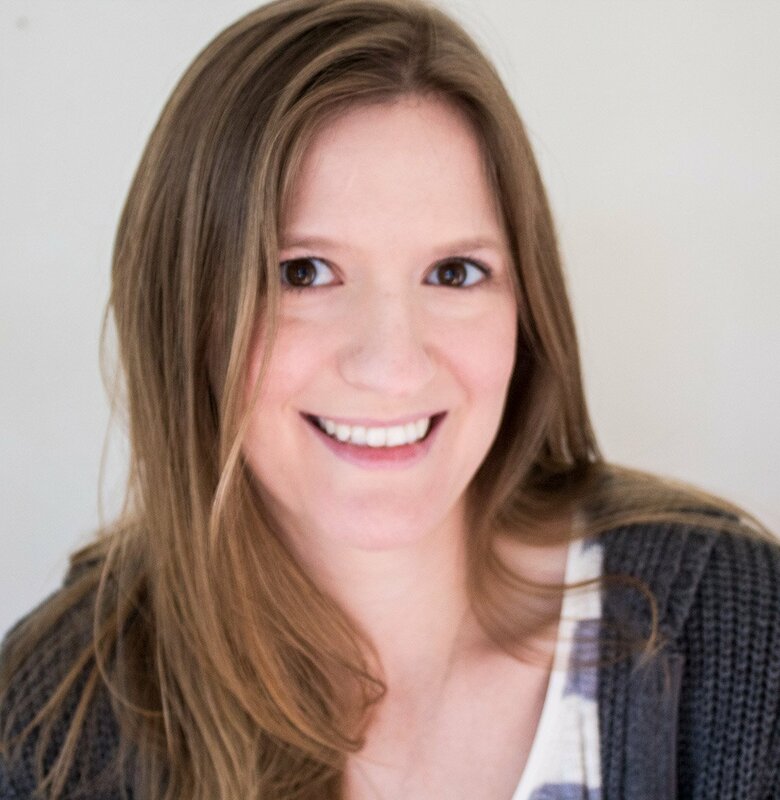 For example, if you have a closet in your entryway with a shelf to put shoes on, a person has to 1) open the closet, 2) take off their shoes, and 3) put shoes on the shelf. That's a three step system. Alternatively, a person could just take of their shoes and leave them scattered on the floor. A one-step system. Guess which one a person is more likely to do? I was really concerned that my shoe drawer, a two step system (open drawer, toe shoes into drawer), wouldn't actually work for me, since I'm typically a tired, lazy, and hungry person when I get home from work. But so far, I've followed the system and put my shoes in the drawer. That being said, would a child follow it? Unknown. 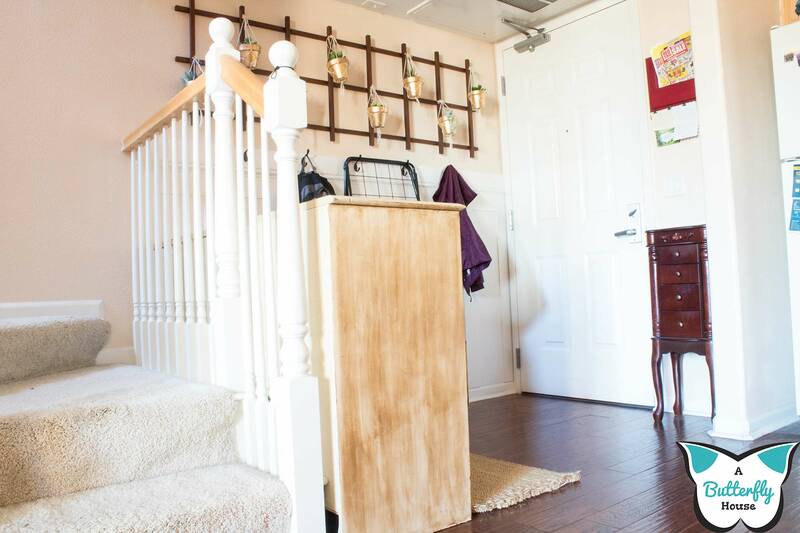 My favorite part of the entryway is the new board and batten wall, because, first of all, it is a one-step system. Take off backpack, hang on hook. Done. It also stores the cart, and doesn't look too ugly doing so. You might be thinking "why store the cart there? Don't you have a better place where you don't have to look at it?" I do own closets. I could Harry Potter the cart and store it in the closet under the stairs. However, the cart is a lifesaver that I use daily to bring in groceries and take out the trash/recycling. 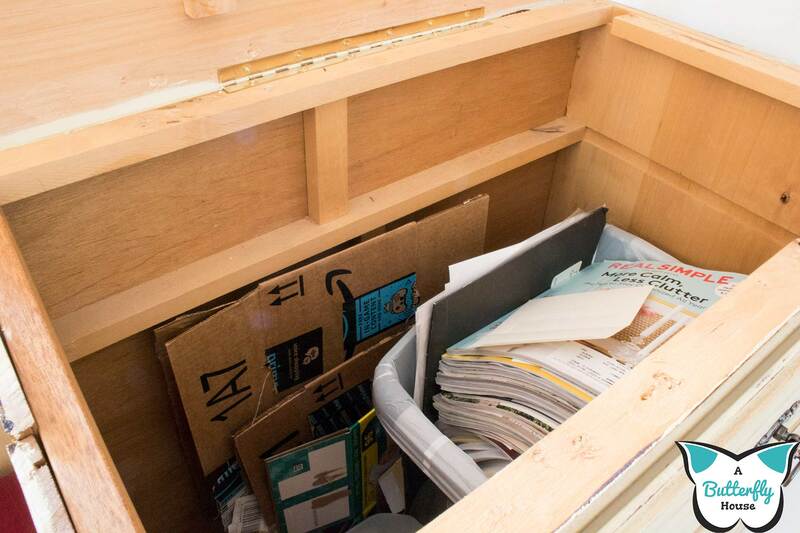 The closet is a good 15 feet away from the kitchen/trash can/recycle bin/front door. If I stored the cart in the closet, I would have to 1) take the cart to the closet, 2) open the closet door and 3) put the cart in the closet. This sounds easy, but I know I would never do it, and just leave the cart sitting in the entryway to use the next day. So I created a nice one-step system of "lift cart onto hooks" so it belonged in the entryway and I might actually put it away. I squeezed one last bit of functionality out of the little space to the right of the door. I glued/nailed a leftover piece of benderboard from the board and batten project to the front of a old cabinet door I found at Habitat for Humanity, then painted the whole thing and glued some clips to the bottom. It holds all the coupon mailers from JoAnn's/Harbor Freight/Bed Bath and Beyond/ anywhere else that sends me something I might actually use. 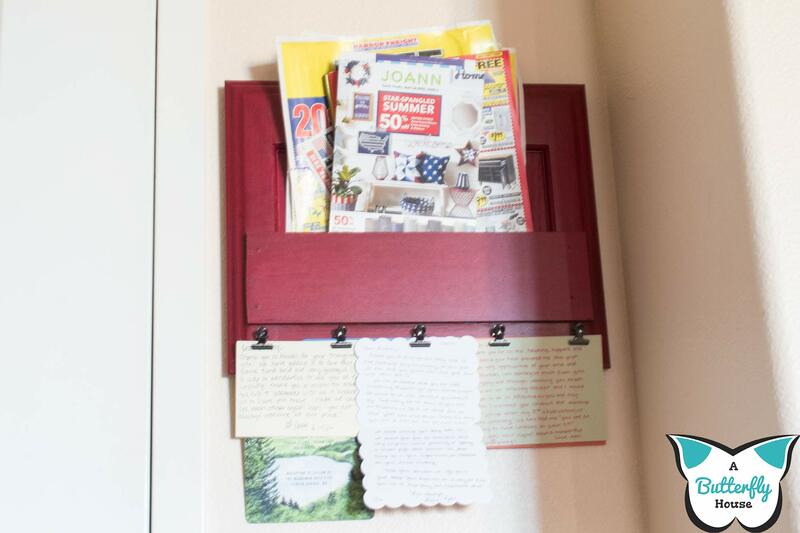 Since before hanging the organizer, the coupons just tended to form a giant pile on my desk, having them corralled here is a significant improvement. Finally, there were a couple of pieces that I thought really tied everything together: the Trellis Garden, the Sisal Flower Doormat, and the Doorside Vanity. I made both the trellis garden and flower doormat; the vanity was something my mother found (apparently for an "amazing" deal, hence why she bought it and then immediately dumped it with me) at World Market about a decade ago. I had everything else done before I added those accessories, and let me tell you, it looked empty. 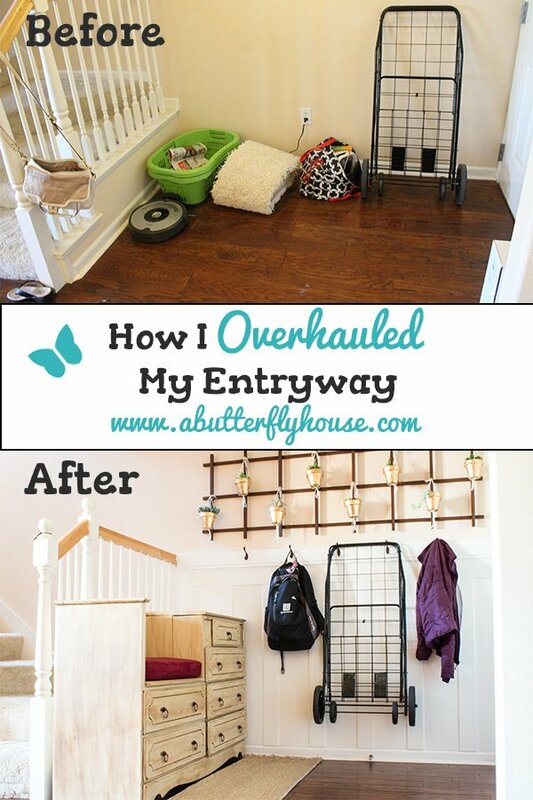 I am so pleased with the way everything turned out, and the fact that I no longer have a permanent mess in my entryway anymore! Have you had any major organization makeovers recently? What did you do? And if you found this makeover inspiring, go ahead and save this post to Pinterest so you can find it again later! Like this transformation? Pin it! Want more room reveals? Follow me on Pinterest!